Who knows why Henley's ever went away but they're back now, returning as a staple of men's attire. 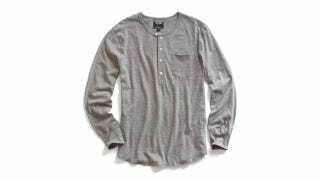 Grab this Slub Pocket Henley from Todd Snyder and save over 60%. Normally $85, you can now get it for just $33! The beauty of the Henley lies in its versatility. While it's a casual shirt first and foremost, it can also work its way into more formal outfits. In colder weather it's a great layer while in the warmer months a Henley is all you need. And Todd Snyder, known for his previous work with J Crew and Ralph Lauren, is notorious for his men's essentials that are both effortless and foolproof. So it only makes sense that he's in the mix as the Henley returns to prominence. This Henley is form fitting and 100% cotton. It's designed with a five button placket, has a chevron-cut front chest pocket, and a curved hem. Choose from heather grey, red, black, or white. Grab it now for just $33 a savings of over 60%.